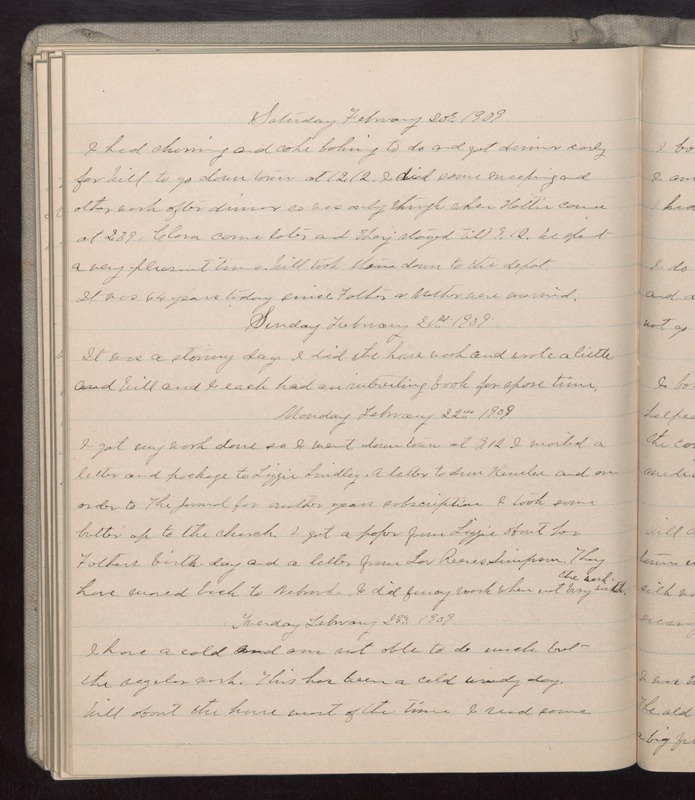 Saturday February 20 1909 I had churning and cake baking to do and got dinner early for Will to go down town at 12.12. I did some sweeping and other work after dinner so was only through when Hattie come at 2.39. Clara came later and they stayed till 9.12. We spent a very pleasant time. Will took them down to the depot. It was 64 years today since Father & Mother were married. Sunday February 21st 1909 It was a stormy day. I did the house work and wrote a little and Will and I each had an interesting book for spare time. Monday February 22 1909 I got my work done so I went down town at 9.12. I mailed a letter and package to Lizzie Lindley. A letter to Ann [Hensler?] and on order to The Journal for another years subscription. I took some butter up to the church. I got a paper from Lizzie about her Fathers birth-day and a letter from Lou Reeves Simpson. They have moved back to Nebraska. I did fancy work when not busy with the work. Tuesday February 23 1909 I have a cold and am not able to do much but the regular work. This has been a cold windy day. Will about the house most of the time I read some.